The OSU Lew Wentz Foundation is guided by four men on its board including, from left, Steven G. Bradshaw, president of the Bank of Oklahoma; Burns Hargis, president of OSU; Jim Orbison, an attorney and distinguished member of the OSU Alumni Association; and Tom Muchmore, editor and publisher of "The Ponca City News." Trish Houston Prawl, front right, is the administrator of the OSU Lew Wentz Foundation and a former Wentz Scholar. Lew Wentz, once known as America's richest bachelor, spent much of his life helping others. The difference his generosity has made in the world and at Oklahoma State University has continued to grow since his death. Since 1926, students at then-Oklahoma A&M College and the modern version of OSU have been offered great opportunities thanks to Wentz's philanthropy and foresight. It began in 1926 with a $50,000 endowment to support student loans. That amount was five times larger than all of OAMC's student loan funds at the time, and equivalent to $679,000 today. Then, he advanced the school $3,000 to loan to six students while the paperwork was being processed. When Wentz died in 1949, he left OAMC another $2.5 million worth of oil leases, equivalent to $25 million today. The OSU Lew Wentz Foundation was subsequently created with a four-member volunteer board of directors, who were all friends of his at the time. The board was, and still is, determined to preserve his values regarding hard work, public service and investment. Over the past 67 years, the program has transitioned its support from student loans to grants, then work-studies, and finally to funding for undergraduate research, scholarships and travel grants for students and faculty. 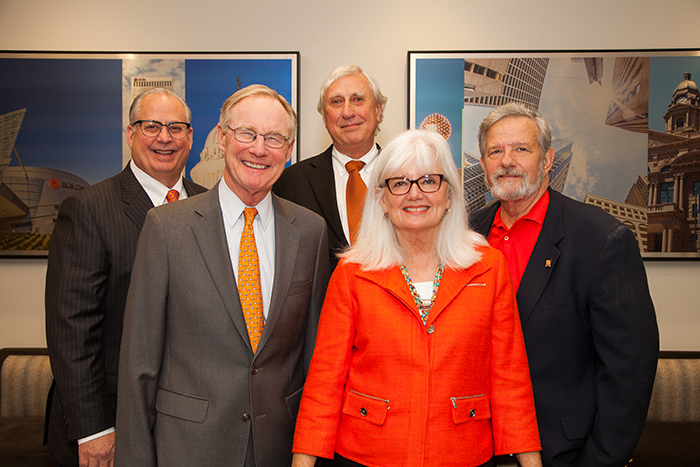 As OSU's president, Burns Hargis is one of the foundation's board members. He believes Wentz would be pleased with what his generosity has accomplished over the years. "OSU is a recognized leader in undergraduate research thanks in large part to the Wentz Foundation's ongoing support for that area," Hargis says. "As someone who never attended college, Lew Wentz left an incredible legacy at OSU and across higher education." Based on Wentz's direction, the foundation's board comprises OSU's president, president of the Bank of Oklahoma, a Ponca City businessman, and a distinguished member of the OSU Alumni Association. The current group is Hargis; Steven G. Bradshaw of Tulsa-based BOK; Tom Muchmore, editor and publisher of The Ponca City News; and Jim Orbison, a Tulsa-based attorney. "It's an honor to follow many Bank of Oklahoma presidents who have served before me," Bradshaw says. "It's a proud legacy that I'm pleased to be a part of because the Wentz Foundation has a real impact on the student-scholars it supports. There are so many success stories of great accomplishments by students who have received Wentz Foundation support." The board also consults with an administrator, Trish Houston Prawl, owner of Celadon Wealth Management. She served as the auditor before the creation of the administrator position about 15 years ago. "She has been invaluable," Muchmore says. "She puts far more time and effort into the operation than the rest of us together and has been one of the secrets to its success. She is devoted to its cause and to OSU but has worked to keep the two separate and the endowment autonomous. She works closely with the investors and watches them carefully." The group meets twice a year to discuss the state of the fund and determine the best uses for its production. The endowment has grown to more than $14 million and provides $750,000 annually to OSU. "We are really, really focused on what helps our students achieve their long-term educational goals," says Prawl, a CPA and certified financial planner. "The endowment is very flexible, so we can shift it to be the most helpful for OSU's needs at a given time. Our goal is to not get entrenched in any particular politics or policy, but to stand back and have a clear eye for what is in the best interest of the university. That can be very dependent on who is the president of the university at the time." Prawl is a former Wentz scholar who has helped the group make many decisions, including its recent addition of more funding for need-based students. "We give away as much as we can and keep operating costs as low as we can, which is what Mr. Wentz wanted," Prawl says. "He had an amazing work ethic and believed in giving opportunities to others, and he expected people to pay it forward. I probably couldn't have attended school without it, and I was working three jobs at the time." Wentz was born November 10, 1872, in Tama, Iowa. He grew up in Pittsburgh, one of seven children of Adeline and Louis Wentz, a blacksmith. The introvert never married and was too poor to attend college. He was coaching high school and semiprofessional baseball, and door-to-door campaigning for the Republican Party when he met John McCaskey, a sauerkraut tycoon and oilman. McCaskey offered Wentz the opportunity to join E.W. Marland's oil business at the 101 Ranch near Ponca City. In 1911, Wentz moved into the city's Arcade Hotel, where he lived the rest of his life. He was tremendously successful in the oil business, becoming one of the seven richest American men in 1927, the year after he established foundations for student loans at four Oklahoma colleges, including OAMC. "Back then, nobody was willing to loan students money," Prawl says. "That was before government-subsidized student loans. And he thought there were too many soldiers returning to America who had no way to go to school. At a time when there weren't a lot of people in the world interested in giving money to others, Mr. Wentz worked 13 years on this concept with various university people before he died in 1949." Wentz was a lifelong Republican, serving as a member of the Republican National Committee from 1940 until his death in 1949. He also served as the chairman of the three-member Oklahoma Highway Commission. Democratic Governor William J. Holloway said that he wanted "to take the state highway commission out of politics," and he believed Wentz's integrity and wealth made him "free from all taint of graft or bribery," according to a contemporaneous newspaper. Wentz was inducted into the Oklahoma Hall of Fame in 1942, mainly for his charitable contributions. Between 1914 and 1948, he donated Christmas toys to every child whose family was on the Ponca City relief rolls. During his lean years, he borrowed money to fund this effort. He built a public pool and camp in Ponca City. He helped organize and fund the Oklahoma Society for Crippled Children and donated the funds to establish the Crippled Children's Hospital, now known as The Children's Hospital at OU Medical Center. He was known to say, "When you mention my name, emphasize the 'We' in Wentz." Jessica Roark is director of the Henry Bellmon Office of Scholar Development and Undergraduate Research. She says Wentz funding is invaluable for the students her office serves. In fact, since the 1998-99 academic year, Wentz Scholars have received 817 awards totaling about $3.5 million. That shows the way the growth of the endowment, which was less than $3 million in the 1950s, is increasing the impact over time. "It's amazing," Roark says. "The research scholarships help the students connect better with faculty, get into good graduate programs and get a jump start on a profession. It's a good opportunity for them to explore and get started. Some learn through doing the research that they want to change their major. That is so much better than if you figured it out years later because you did your first work in the field after you graduated." Another great benefit is for the faculty, who can do extra research thanks to the contributions of these undergraduates who would otherwise not be involved. "It's consistent with OSU's mission as a research university," Roark says. "It increases connections between students and professors who are doing this cutting-edge research. It increases involvement, excitement and discussions going on in their disciplines." The Wentz Foundation also provides scholarships for OSU's Cambridge Scholars Program, which allows students to take a two-week course at England's legendary University of Cambridge, often taught by an OSU faculty member. Roark says the experiences gained from a Cambridge trip and the research program are invaluable for students pursuing prestigious national scholarships. That is evident, as Wentz Scholars have gone on to become Rhodes, Truman, Goldwater, Gates Cambridge and Udall Scholars, as well as National Honors Council Board Members. "Students who get those major awards are doing incredible things, because that's what it takes to earn those awards," Roark says. "They are researching things that truly make a difference in the world Exponential is the only way I can quantify the difference the Wentz funding makes, because of the way the students pay it forward." Orbison succeeded his father as a member of the Wentz Foundation board. He has enjoyed watching the results over the years, with so many students going on to great success. "That shows me that it has been a benefit of more than just money," Orbison says. "We have been fortunate that the scholarships have been awarded to and targeted toward the right people. We are always thinking about who they should go to, as well as how to be good stewards of the money he left." Muchmore agrees, noting that the board does its best to follow Wentz's wishes. He wanted to give students a way to fund their educations and then pay it back. That has led to the modern version, where repayment is made through a debt to society. Scholars are chosen based on performance, potential and commitment. 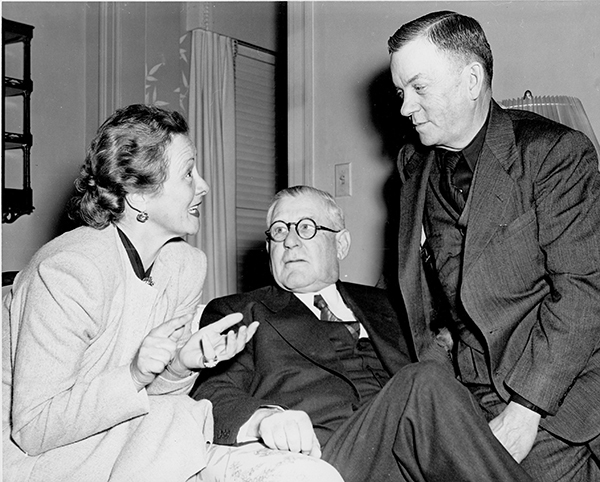 Lew Wentz, center, talks with actress Irene Rich and Dean W.L. Blizzard of OAMC's Agriculture Department at the California home of the late Will Rogers in 1947. "I am very proud of the accomplishments of the board over the years and the number of students who have been helped," he says. "The fact the endowment has kept up with the economy for so many years is impressive and the amount of money used each year to benefit the students has tended to increase as necessary. We will always have discussions on the method and the intent of the endowment." The OSU Lew Wentz Foundation not only exemplifies Wentz's foresight and generosity. It also shows the value of an endowment. Because of its growth over time, it provides more support to OSU over a four-year span than the value of the initial estate gift. That is why its impact has been exponential, as Roark says, instead of having been spent decades before the birth of today's OSU students.